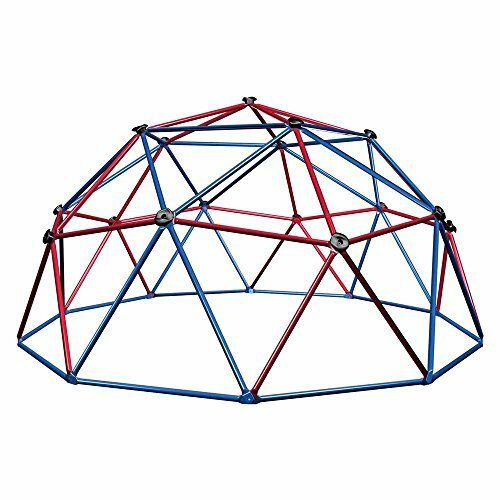 Lifetime Dome Climber Play Center provides a 10-Foot Radius climbing structure for 4 to 12 year old children. If you're looking for big toys to keep the kids entertained in your own backyard, check out this awesome big toy from Lifetime--the geometric Dome Climber. This is a big toy that several kids can enjoy at the same time. Big toys like our Dome Climber help your child to develop strong muscles and coordination. Our Dome Climber is a fun, geometric design with real rock climbing hand grips. It is constructed of powder-coated steel to prevent rusting and peeling. Like all of our big toys, the Dome Climber is made from top-quality construction, and built to last--a big toy that will be a backyard attraction for many years. Constructed with 1.5" diameter and 33" lengths of tubing.